In my last post I featured a picture of an Israeli commando being treated by a passenger of the Marmara (you know, the ship where the passengers intended to kill the commandos, according to the IDF Spokesperson office.) I took that picture from Ali Abunimah's blog, and he had it from a Flickr site. So when I saw that Robert Mackey of the Lede NY Times blog had not posted the picture with other pictures released to news agencies, I called him on it, as did others. At first he said he wasn't sure the picture was genuine, and he referred me to doubts expressed by Noam Sheizaf in his Promised Land blog. But all Noam had said was that he didn't know whether it was genuine or not, not that he doubted its authenticity. In the meantime, Mackey did some important leg work, and tracked down the passenger, a Dr. Hasan Huseyin Uysal. He and Sebnem Arsu conducted an interview with Dr. Uysal here. First of all it's against logic that these soldiers would not be killed but instead be taken to the medical center if the intention of the activists was to kill them. If people on board were so eager to hurt them, why would they not just shoot them to death once they had taken their guns? Why bother carting them inside for treatment? It just doesn't add up. I am a doctor, and the Israeli soldiers were brought to me to check their medical situation and treat them properly. I had our dead bodies and injured people lying in front of me and I was treating the soldiers that actually killed and wounded them. None of our friends in the center approached to harm or hurt them. Our injured people were lying on the ground, but I rested the soldiers on our chairs. None of the soldiers had any fatal wounds that would cause organ loss or defects. There were scratches on their faces, but since facial skin is sensitive and very likely to bleed in any trauma, there was blood on their faces — which I cleaned carefully to see what kind of injuries they had. In the end, they happened to be only scratches. The third soldier, however, suffered a cut in his stomach that reached his stomach membrane but not the organ itself. It was nothing fatal. As a doctor, I wouldn't want to guess the nature of this injury but it could have been caused by either landing on a sharp pole from the helicopter or a blow from a pipe with a sharp edge. I couldn't tell. In either case, it was not fatal but it had to be stitched. However, since we did not ever expect such a confrontation, we had not brought any stitching equipment on board. All we had was simple medical material to dress simple wounds, or drops to ease burning in case tear gas was used. If I had stitching material with me, although I am an eye doctor, I would have treated the boy properly in accordance with my general medical knowledge. I couldn't. With my broken English I tried to tell them that I was a doctor and there was no need to be afraid and that nobody was going to hurt them. They relaxed after a while and watched us running around, jumping from one patient to another in tears, faced with our friends bathed in blood. I also asked our assistants to keep an eye on them so that they would not be threatened. We could have as well left them to their fate, but this is not the humanity that we act with. We asked photographers not to film in the medical center and I have no idea how and when that picture was taken but God never leaves good deeds unheard. That picture shows the difference between the Israelis and us. Asked if he could tell how long after sound grenades were thrown at the ship, at the start of the raid, that the gunshots were fired, Dr. Uysal said: "I was in the lower deck, but could hear all the explosions and gunfire. There was no way I can differentiate the gunshots or other sounds — I am only a doctor, after all." They handcuffed all of us with plastic bands so tightly that they could easily cause irreversible damage to our shoulder tissues. They made us kneel on our knees with hands handcuffed as the helicopters caused sea water to splash on us for three hours. I was shouting that I was a doctor and that my shoulder hurt in a very serious way. They pretended not to hear me. I wanted to go to the toilet; they didn't let me. After I kept yelling about my shoulder they let my hands loose but not those of my friends. 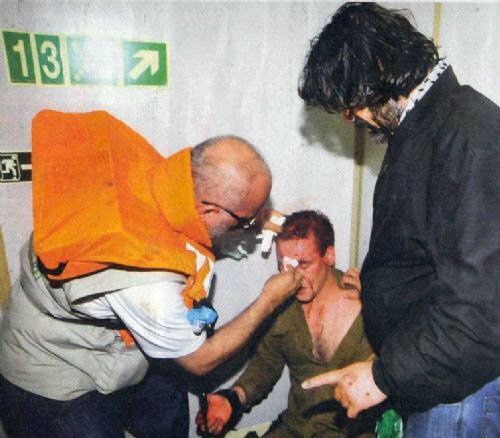 On Tuesday, the Turkish newspaper Hurriyet published an interview with Murat Akinan, the man seen standing next to Dr. Uysal in the photographs of him treating a commando, and bringing the Israeli inside the ship in another photograph. Mr. Akinan said that the captured soldier had been entrusted to him by Bulent Yildirim, the director of the Turkish aid organization I.H.H., who said: "Murat, take him and make sure that he'll be safe. Be careful, don't allow anyone to touch him." So, Mr. Akinan said, "I took him downstairs yelling, 'Stop! No one will touch this man entrusted to me.' "
He added: "I called the doctor on board and asked him for treatment. Two more soldiers came. People were reacting. I had all three treated. I said to two to three wise people around me that we would not allow anyone to touch them." According to Mr. Akinan, during his subsequent interrogation in Israeli custody, he was shown a photograph in which the soldier he was leading inside the ship was hit despite his efforts. "I told them that I couldn't stop everyone," he said. He also claimed that the interrogator admitted that photographs showed that he had acted "with goodwill" toward the Israeli captive in his care. Back to Jerry. Cynics will say that the commandos were more valuable to the Turks alive (as hostages) than dead. But that flies again in the face of the IDF Spokesperson remarks above. And according to Haaretz, an Israeli intelligence and terrorism NGO reporting that according to intelligence reports, the troublemakers on the deck were about 40 Turkish “security guards” associated with the IHH, and that the rest of the passengers were not involved. That’s a bit less than 10% of the boat. The report said while most of the Mavi Marmara's 500 passengers were humanitarian volunteers who underwent security checks before boarding the ship at Antalya in Turkey, a group of 40 IHH activists had boarded the ship in an Istanbul port beforehand, keeping apart from the rest of the passengers throughout the journey. If these reports are correct (and they have all sorts of problems with them, which I won’t go into now), then that would not conflict with the behavior of good people like Dr. Uysal. But once again, how can we believe Israel until an independent investigation is launched? who exactly will be in charge of the so called independent investigation? oh thats right...you still think that the goldstone report was free of bias. think this guy is lying too? if what the passengers (except for the egyptian quoted in the above story) said is true...do you really think that the passengers could have wrested the weapons from the idf commandos? there is no logic or reason to it. you know how many times a person who is handcuffed screams about the cuffs being too tight? maybe you should talk to someone in law enforcement. the article and that interview are another propaganda ploy to make the idf seem like cowards. where are the dead bodies? one thing pallywood loves to show is dead bodies...this alleged doctor says that there were dead bodies all around him while he was treating the commandos....where are they? know why they have yet to release the pics of the dead bodies? because the pics wont jibe with the faux coroner report. and by the above "journalist's" account...the "activists" did indeed intend to commit grave harm upon the soldiers. so there should be an investigation because these people cant get their stories straight? Those commandos in the hospital were there by accident? How does any of this disprove the idea that they were kidnapped with intent to use them as a way to get to Gaza? It's ironic that the one argument that makes total sense and completely defeats the premise of this article and your previous one, is the one argument where you choose to believe and use the IDF spokesman as your excuse for disbelief. There is another simple point to be learned from this interview. There were already dead and injured passengers on the ship at this point. There had been people on the deck who were unafraid to launch vicious attacks on commandos. From this we know that there were people who wanted to hurt the Israeli soldiers. Why would they suddenly stop wanting to hurt them? There are two possibilities, since humanitarianism is not possible when people are using iron bars to beat the soldiers, the first is that they wanted live hostages - the importance of Shalit is not lost on the Muslim world - or the violent ones who had led the attacks on the soldiers were now dead or injured. Either way, you still have Israelis being ambushed, attacked and then responding only when attacked. On the basis of the (contradictory evidence) lets get some things straight. Or rather, let's make some reasonable assumption. The activists, or at least some of them (according to Israel's Malan, around 10%) were ready for a fight. If the commandos came on the ship armed, that would be perceived as a direct threat. So none of my readers, left or right, have any case to say that from that point on, the passengers had no right to defend themselves. Even if the IDF arguably had the right to enforce the blockade, the passengers arguably have the right to defend themselves -- precisely because the legal status of the raid is in dispute. Had the ship been the Exodus rather than the Marmara, and had its cargo been refugees rather than humanitarian supplies, the rightwing commenters wouldn't have had any problem. I am not saying that resistance was the correct thing to do. I am only saying that it is justifable. And, frankly, Israel is already easing the blockade because of the Marmara. Again, reminiscent of the Exodus. So I ADMIT that those passengers, about 10%, it seems, were spoiling for a fight. bacci, Israel admits to 9 dead; the passengers report more. What is your problem here? the trouble with you bacci, and it goes to the root of your tribalism, is that the word "some" is not in your vocabulary. It is always "they", "them". They are all terrorists; they are all in it against us; they are all part of one big Islamist conspiracy. Oh, they may pretend to be different from each other, but it is all coordinated. These guys, the ones in the picture, were the good guys. Dont you get it. They were the good guys. There were lots of other good guys, both among the Israelis and the Turks. Why does it hurt you so much to say it, bacci. Why must it always be us or them. Take a deep breath, my friend. Don't you see how deeply biased you are to dismiss this as propaganda? Resistance was not justifiable at all. The other five ships have proven that. The fact that Israel offered Ashdod as a port of inspection and entry also proves that. There is nothing that suggests resistance was justifiable. These people knew they were likely to encounter the Israeli military and took steps to organize themselves for a vicious fight. It's not complicated: you tangle with commandos on a mission and you should expect to be severely hurt. google "no humanitarian aid found on marmara" and show me a single credible news organization that reproduces it. Fox news was there, says Middle Peace. Well, why hasn't Fox news reported it? By the way, bacci40, do you think that Obama was born in Hawaii? "These people knew they were likely to encounter the Israeli military and took steps to organize themselves for a vicious fight." As everybody knows, the most elite unit in the IDF can be defeated by metal rods and kitchen knives. Let me repeat that until there is an external investigation, we will not know much about what transpired. We won't know for example if the IDF execution style killing portrayed here was justified or not. Or whether it occurred or not. Well, we do know a little bit more now. At the end of this article, we learn the IHH was responsible for the killing of an Egyptian soldier in an effort to get into Gaza near El Arish. It turns out the Turkish government placed pressure on Egypt at the time. Shouldn't you be calling for an investigation of Turkey? And don't worry about the toughest Israeli soldiers. You should be busy thanking them for protecting you when you live in Jerusalem. the ships had food, medicines, humans. these are existential threats to the jews and needed to be attacked, confiscated, murdered, destroyed. jews come and defend your violence, your inhumanity. great pallywood stuff...and backed up by one of the "peace activisits"
that she would openly lie about what we are watching...that amy goodmand and juan gonzalez would be a part of this propaganda hooey, is why i use terms like they and them. listen to gonzalez' inane question about the footage released by the idf...the guy never heard of night vision cameras. and this is simply another reason why any international investigation would be a joke. No, 5 Dancing Shlomos, the ships were asked politely to divert from their course so that the Israelis could check their cargo first to ensure it didn't contain arms. A reasonable request. The type of request somebody who wasn't trying to launch into a fight with Israel would have accepted readily - after all, what's more important, getting the humanitarian supplies to the Gazans, or picking a fight with the Israeli navy? In any case, these boats may not have been carrying weapons, but once the blockade is removed, how will you prevent the movement of weapons to Gaza by ship? I know! You would like that because then when Hamas bombs Israelis, you can say they deserve it, and when Israel attacks Gaza, you can say they are war criminals. you think im a birther? do you believe in the dancing israelis story? Ah, a telling little story. Apparently, the captain tried to stop the IHH folks from tackling the navy. Do you think it might be because the captain knows that when you tangle with soldiers, you're going to get hurt? Why are you so certain that the people who were killed were the people who "tangled" with them? Why are you so quick to accept the Israeli account at face value? All people agree to is that there were a bunch of Turks who were not pacifists and who used violence against the commandos. We still have no idea what triggered the violence. Israel released a film but we don't know what preceded it. Israel has collected all evidence it could get its hands on, including international press, and is releasing what it wants to release. Why would anybody who is not a partisan believe them? One more thing. Israel is expected to release bits and pieces of stuff that it finds to its advantage. You have links? I won't publish them here. But I will publish links from bona fide news agencies like the New York Times. That's fair. I don't plan to publish the hitlist of Israeli assassinations discovered on the boat, according to a video on youtube. We are now expected to know that Israeli intelligence did not know of fifty terrorist thugs sailing towards Gaza; they were surprised by them. Take your pick -- colossal failure of Israeli intelligence or spin. Colossal failure. Failure of intelligence, failure of planning, failure to understand that this was the worst reaction possible. The only ones who didn't fail are the soldiers, who got themselves out alive from a brutal ambush and potential kidnapping. As to why I believe them, it's because they're the sons of your neighbors and the husbands of your colleagues. It's because the army doesn't teach to murder indiscriminately. It's surprising that after so many years in Israel, you don't understand this. "...from bona fide news agencies like the New York Times." I guess then you must be a fan of Stalin. After all he is only an agrarian reformer. That's what the New York Times said, so it must be true!